BY PATSY McGONAGLE: Finn Valley AC has over many years, 40 to be exact, created a great community / family event that is the Finn Valley 5k, raising tens of thousands of euro for various charities. And the club will do so again on Sunday 26th at 2pm from their Centre in Stranorlar with people turning out for the charity of their choice or simply just getting out and about meeting up with friends home for Christmas and entering into the spirit of the ocassion. News coming in as we get within days of the festive event is that the 2011 honorary starter is none other than local Glenfin man Mickey ‘the post ‘ Gallagher. Finn Valley are pleased he has agreed to attend, fire the gun and get the hundreds of young and old underway. Previous honorary starters have included former Lord Mayor Cora Harvey, Pat the cope Gallagher M E P ,Sinead Jennings world rowing champion a participant this time round ,Olympic cyclist Philip Deignan,comedian Conal Gallen etc. 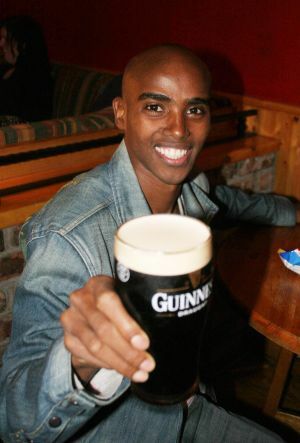 Course records stand to world champions Mo Farah pictued here raising a glass on his last visit having returned 13-25 and Kenyas world lead and olympic champion Vivian Cheruiyot her time for the course 16-14. Mary Cullen a European medallist and olympic hopeful has expressed an interest in being present and also Olympic rower Sam Lynch will be taking the challenge and Jason Quigley Irish international boxer currently in Los Angeles where he boxes with the L A Matadors in the world Series will be home and on the start line as indeed will representatives of all the local sporting clubs . Registration begins 11 am you can enter right up to 1-30, welcome to run /walk /jog indeed just go for a dander in the fresh air . Organisers would find it useful if you pre registered at finnvalley1@gmail.com and all are welcome fingers crossed for a good day. Its an event for All 8 to 80 .